We had a blast at the Ranger Creek Brewing 5k Beer Run! Thank you to everyone who came out and supported the event! Pictures will updated on our Facebook page ASAP. You can find them HERE. The Ranger Creek Brewing 5k Beer Run is the third event in the Texas Beer Series. Ranger Creek Brewing and Distilling is known for their amazing craft beer and great whiskey. This fun and social 5k beer run will be hosted at Ranger Creek Brewing’s taproom and brewery at 4834 Whirlwind St, San Antonio, TX 78217. Packet pickup starts at 12pm and the run begins at 2pm on Sunday, May 7th, 2017. Registration is only $35! Sign up soon to guarantee your spot in this FUN and SOCIAL 5K! The price goes up to $45 on March 6th, so sign up today and save! **Make sure to register by Monday, April 24th to guarantee your shirt size! ** We are ordering extra shirts, however participants who sign up after April 24th aren’t guaranteed a shirt. 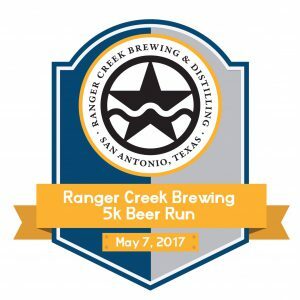 The Ranger Creek Brewing 5k Beer Run is a unique event You don’t have to wait until the end of the 5k to enjoy Ranger Creek Brewing’s great beer; we will have samples for you throughout the race! Everyone will get to enjoy their first sample of beer right away, because we will begin the race with a celebratory “cheers!”. This 5k course is a five lap, 0.62 mile loop around the brewery. After each lap, you will get another sample of AMAZING Ranger Creek Brewing craft beer! When you finish the 5k you will receive a souvenir pint glass as your finisher’s award. Pint glasses are our favorite kind of finisher’s medal! Packet pick up will be onsite at Ranger Creek Brewing’s taproom and brewery from 12pm-1:45pm on race day, Sunday May 7th, 2017. Come out early to get a good parking spot and enjoy a pint before the run. The 5k run will start at 2pm. Ranger Creek has chosen the Fisher House Foundation as their charity sponsor for the Ranger Creek Brewing 5k Beer Run. San Antonio is Military City, USA! We support the troops and love foundations who do the same as well. The Fisher House Foundation is a wonderful organization who takes care of those who need it most. The Fisher House Foundation is best known for a network of comfort homes where military and veterans’ families can stay at no cost while a loved one is receiving treatment. They have served more than 277,000 families since inception and have donated over $11,000,000 in scholarship awards.